I found your website over three years ago and if anyone wants to know, your Juicy Fruit program WORKS LIKE A CHARM. Now it is just a matter of sticking a piece of gum in a new mound and voila! no more mole. This year ONE mound so far and people have dozens in their large open yards all around here. Thanks for sharing such a crazy trick that works. Is this what your front yard looks like? 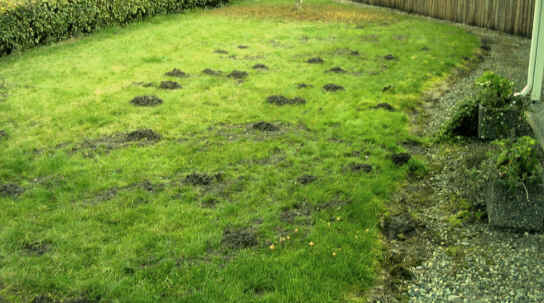 If someone tells you that they can "TOTALLY RID" your yard of moles permanently, then ask them for a written guarantee. It probably is not possible to totally get rid of moles unless you treat the whole county. There will always be moles coming back into your yard after a few months from your neighbors yards. They migrate. So if your neighbor has them, eventually you will be re-infected just like flies in your house if you leave the door open. You probably will never "GET RID OF THEM". But you can control them. 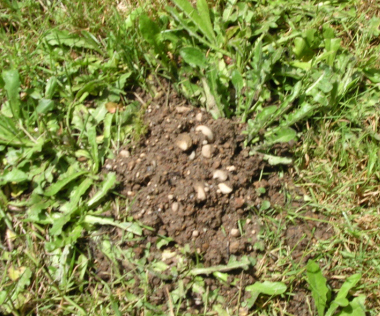 When you see a new mole hill in your yard, if you immediately treat it, that will stop them again for quite some time. 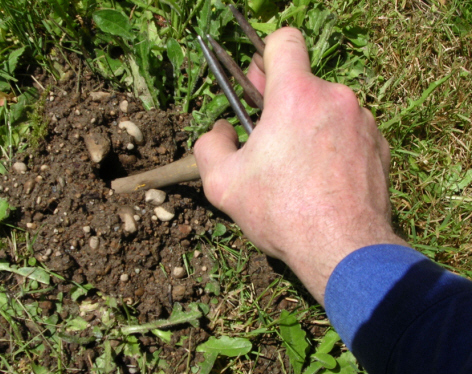 If you have a very sever mole problem it may take you the whole summer the first year to stop them. DON'T GIVE UP. Even if you have to treat them every few days for 2 or 3 months the first time, know that once you have them in control, then it will be easy to keep them in control. Normally a yard will only have one or two re-introductions of a mole in one season once you get the current population all taken care of. So be confident in knowing that it is very possible to control them so that no one even knows that they are around (except you). 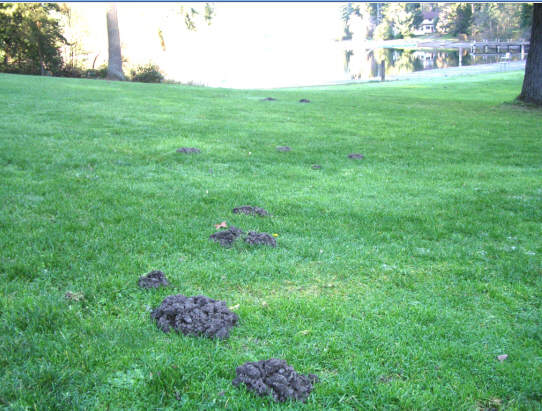 Here are some pictures of the worst mole problem we have ever treated. 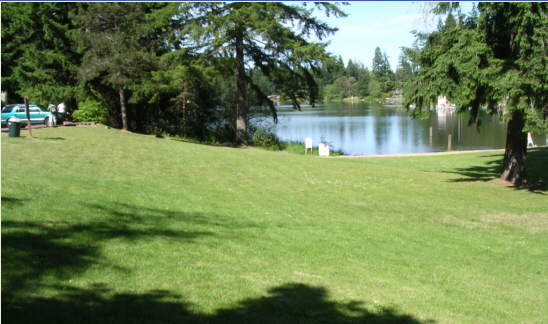 It is Horse Shoe Lake Park in Wauna, WA. These pictures are before our treatment and then after 3 months and 6 months. 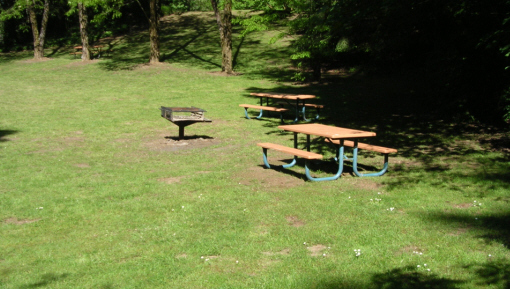 This picture is of the picnic area before we treated it. There were 50 or 60 mole hills there in that area of the park. Here is that same area of the park 6 months later after my treatments. If you look close in this picture above, you can still see the scars in the lawn from the old mole hills. 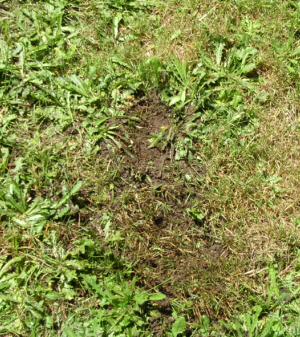 It takes all summer for the grass to grow back if you left the mole hill there long enough for the dirt to kill the grass. Here is the main part of the park before our treatment. There were probably about 200 mole hills there in the main part of the park when we started. 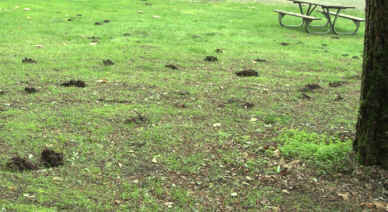 The moles were all over the park. And here is that hill in the park after 6 months of weekly treatments. After six months of treatments, the moles were gone. The second year we found about 3 or 4 new mole hills in the whole park at the beginning of the year (in the spring). So I just treated them and no more moles for the rest of the summer in the park. This year (2008) there were no mole holes any where in the park in the spring. BUT THEY WILL BE BACK.... Eventually they will come back a few at a time. They will always come back, but with just treating the few new holes as soon as you see them, you can easy control them. You just have to do it as soon as you see them come back or they will multiply and within 2 months you will be starting all over again. Originally our company called Moles Be Gone sold a product called "MOLE BATE STICKS". However, because of the expense involved in manufacturing them, we have discontinued making "MOLE BATE STICKS". Now every one is upset because they want to reorder because "MOLE BATE STICKS" worked so well. (If you doubt that, look at the counter at the bottom of this page). We have had many people ask if we would give them the secret formula. We are not willing to do that but to keep peace in the world we have devised a method you can use that is very similar to using "MOLE BATE STICKS" by teaching you to make your own mole bate. 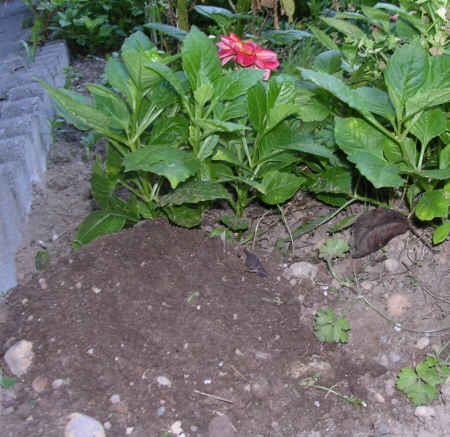 This home remedy mole bate formula works quite well and you will be satisfied with the results if you are persistent in taking care of the moles every time they come back into your yard. 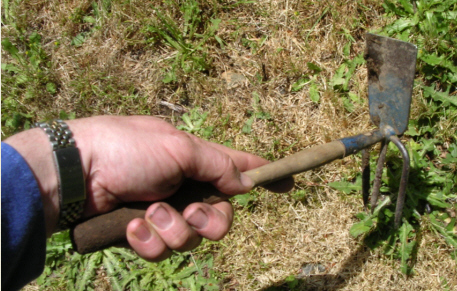 If you will take a little time to make your own mole bate, you will then have no need for mole traps (who could stand to use those things anyway???). No more putting the garden hose in the holes to try to drown them. No more trying to hook the car exhaust up to gas them. No more antifreeze. NO MORE POISONS that could harm your pets or children. Don't even need to by expensive mole bate from the store. Some of those things work but why bother. You can make your own mole bate. 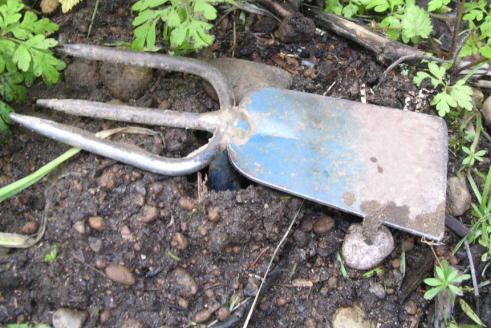 The home made bate is easy to make and is perfectly safe (except for the moles of course). 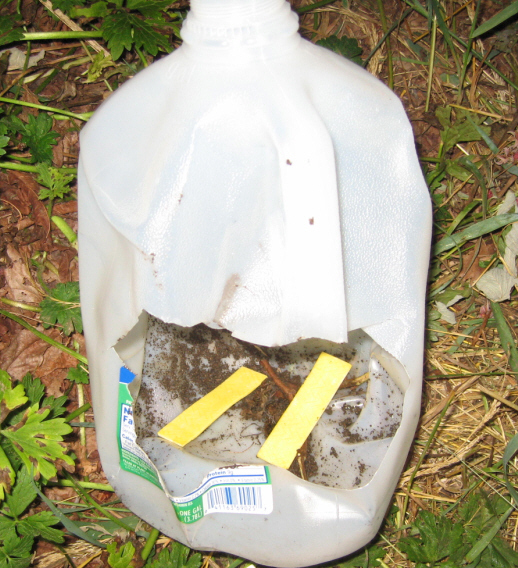 All you need to do is put the mole bate in the mole hole or in their burrows and in a few days there will be no more moles in your yard and you will normally not see any more again in your yard for several months. You do not need to have those ugly dirt mounds all over your lawn or garden any more for neighbors to talk about. You don't need to have those mole holes running around your garden to siphon water off to waste when you water your flowers. All that can be past history now. It can be something you will talk about with friends when you talk about the "OLDEN DAYS". Don't let moles stand between you and a beautiful yard. 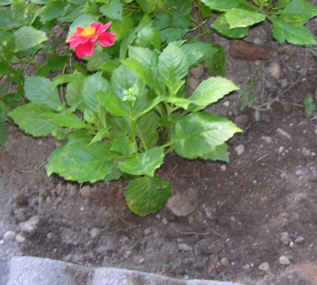 You can have new hope for a beautiful mole free yard and garden again with a little do it yourself project. Here then is a very easy way to get rid of moles yourself. The main ingredient in "MOLE BATE STICKS" was a gum base. But you should not try to make your own gum at home. That requires very high temperatures. If you tried to use ordinary pots and pans to make it, they would most likely scorch and be ruined. Something that will work almost as well for you in your home remedy, is just regular chewing gum from the store. It will work just fine to make your own home remedy mole bate. Juicy Fruit gum is the flavor of gum you need to buy. The brand does not seem to matter but DO NOT try to use a different flavor of gum. Because you are not using a natural gum base with no flavoring, you need to use a flavor that moles will eat. We have found that moles don't like the smell of any other flavor of chewing gum. When you touch the chewing gum be careful to not touch the gum with your fingers, so the human sent is not on the gum. When you take the gum out of the wrapper, you can just use the paper wrapper to touch the gum as you put it in the mole hole if you don't want to wear rubber gloves. Buy enough gum sticks to put one in every mound in your yard. If you have a really BIG mole problem, you can buy large packs of the gum at CostCo quite cheap. Now here is the a little secret to help you make your home remedy mole bate mole treatment more effective. Find an empty milk carton and cut the side out of it. Then open the chewing gum and put the chewing gum sticks into the milk carton. 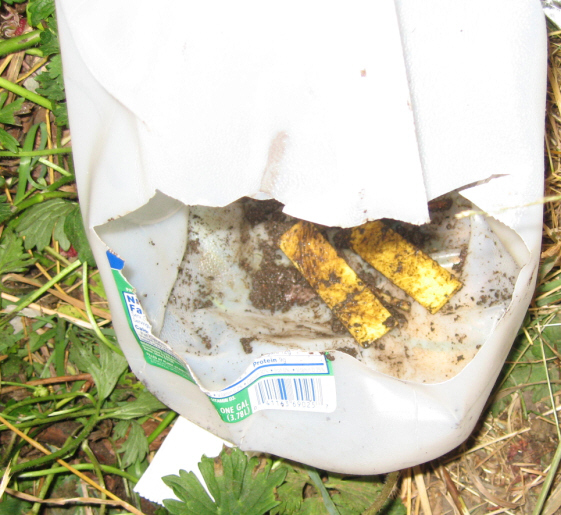 Then catch a few earth worms or night crawlers and put into the milk carton with the chewing gum, being careful to take the gum out of the wrapper without touching it with your fingers. Now shake it all around until all the chewing gum sticks are covered with a coating of worm substance. This way, when you put the chewing gum in the mole holes it will cause the moles to be more anxious to eat the bate. 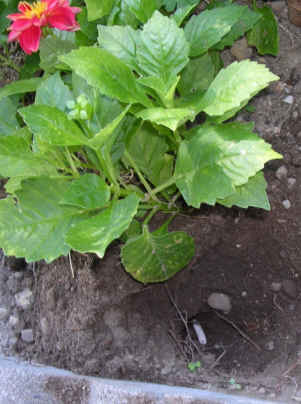 Worms are one of their main foods. Putting this coating on the gum will be very effective in getting the moles to eat the gum. It is the gum that kills the moles. When they eat it, it clogs up their insides and they die. Now you have made your home remedy "MOLE BATE STICKS". If you will just follow these 5 easy steps below, your mole problem will be in control. Lots of people have laughed at this method, especially professional abetment exterminators. Why wouldn't they laugh when you tell them it is free and you don't need their service any more. 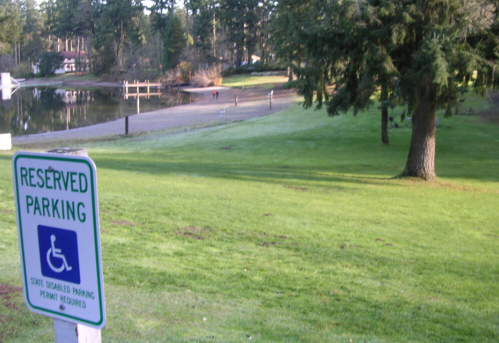 If you have a doubting friend just ask them to look at the pictures of Horse Shoe Lake Park above as proof it works ...... or tell them to just come back in 3 months and look at your mole free yard, that did not cost you more than a couple of bucks for the chewing gum an a little of your time. 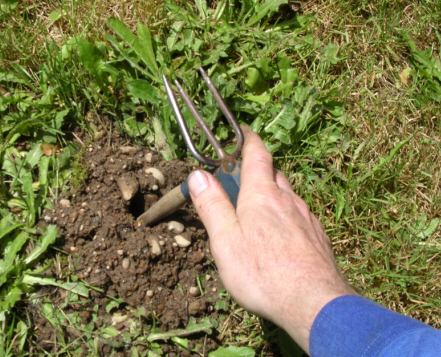 Step 3: Use the garden tool to smooth over the mole hill dirt again so you don't touch the dirt with your bare hands. You do not need to worry about not getting dirt on the chewing gum. As long as you put it inside the tunnel, the mole will find it. Moles love the gum and worm scent and will find it as they try to clear the dirt from the tunnel again. Step 4: Now follow that same procedure on ALL of the mole hills around the yard. 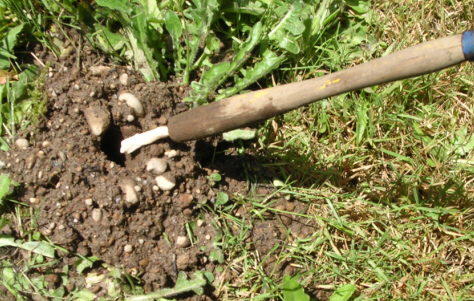 It is best to put a stick of chewing gum in every mole hill. If the hill is really big, you may want to put two sticks of gum in that mound. After you put the gum in the mound, it is best to smooth over the dirt from the mole hill so you can see if any new ones pop up. It may take 2 or 3 days for all of the moles in the tunnels to find some of the bate, so for a couple of days you may need to continue to just put gum in the new mounds and then smooth them over too so you will still see any new mounds. When there are no more new mole hills popping up, you will know that all of the moles are gone. Step 5: Properly dispose of the milk carton and gum packaging. THAT IS IT: It is that easy. NEW TREATMENT: Mole abatement may be necessary again from time to time because moles will burrow in from your neighbors yard. 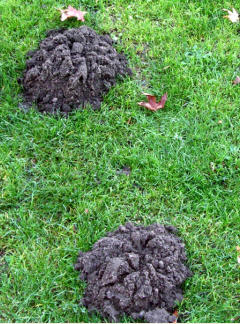 After a few months, if you see new mounds pop up, just place a stick of your home remedy mole treatment gum inside the tunnel and that will be the end of the new mole invasion. Most of the time you done even need the worm slime coating to get them to eat the gum. If your neighbors will treat their yards too, then you won't see any more moles in your yard at all. Because they may not, you most likely will need to repeat this treatment at least once each season. Any tool with a long narrow handle like this will work. You can even use a round sharpened dowel as a tool to help you find the tunnel. 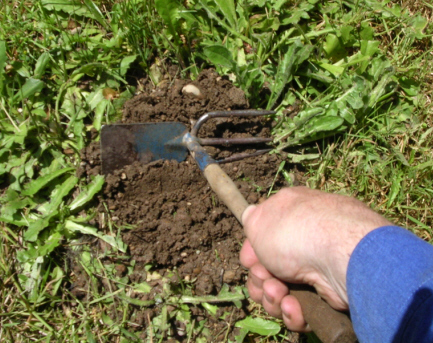 Just poke the handle around in the mound until you find the tunnel under the dirt mound. You will know when you have found the tunnel, because the tool will slip easily further in into the tunnel with out resistance. The tool handle may go down into the ground the full length of the handle. That is a good sign you are in the tunnel. If you can not feel the tunnel you may need to remove the dirt mound so you can see where the hole in the lawn is. Now pull the tool handle back out and push the stick of chewing gum in the hole you have made with the tool handle. Continue using the tool handle to push the chewing gum stick all the way into the hole. You can now use the other end of the tool to move the dirt off the mound so it will cover up the hole and be spread around so it will not kill the grass. When you are done there should be no dirt covering the grass. As mentioned above, another reason you need to remove the dirt mound so you know if there are any new ones that have popped up that you have not treated yet. Each time you see a new mound, just put a stick of gum in the tunnel and in a few days there will be no more new mounds. Just do that for every mole hill you find for a few days and you will have them in control. If they come back next year (and they may) just put a gum stick in the hole as soon as you see them and they will be gone for another season. You will never be rid of them if your neighbors have them. But you can effectively keep them out of your yard by just putting a gum stick in an new hole you see. I get moles back in my yard about every other year in the spring time. 10 minutes and a 99 cent pack of gum and I am done for the year. How could it be easier than that? This really does work if you keep at it.